With Sim back from his successful visit to the UK, we decided to rent a car for the day and do a little sightseeing. The car arrived in the usual Caribbean manner – late and slightly battered. Sidney, the man that rented the car to us, handed over the keys having delivered it personally to the marina without taking payment or asking to see a driving license or any kind of identification!! Wonderful. 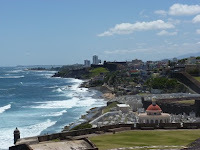 Off we went, joined by John from “Stingo” on our bonny way, hurtling down or up I should say, route 52, all the way to Old San Juan on the north coast of the island. 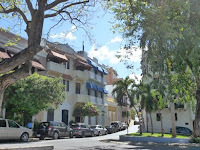 Old San Juan is on a small narrow island connected to the mainland by 3 bridges. 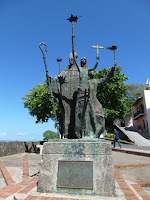 It has the Atlantic Ocean to the north and Bahia de San Juan to its south. 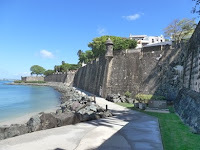 It is a UNESCO world heritage site surrounded by a 42ft high wall and guarded by two forts. 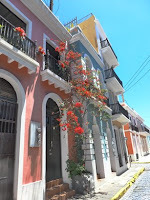 We strolled around the blue cobble stone streets lined with different colonial Spanish houses in various bright colours each with their own intricately designed balconies and hurricane shutters. 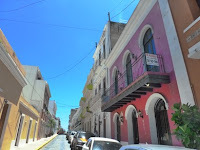 The whole area is beautifully maintained with no garbage on the streets, no peeling paint or falling down properties to be seen anywhere. 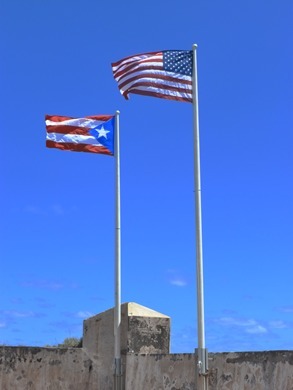 We walked to Castillio San filipe Del Morro (El Morro Fort) which towers over the tip of the headland and guards the entrance to the bay. 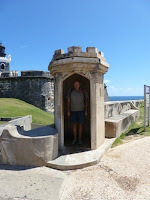 It dates back to 1539 and is said to be the oldest Spanish Fort in the New world. Having worn ourselves out from all the walking we had some coffee in the shopping district where the expensive cafes and gastro restaurants line the streets and decided on our next course of action; which was to jump back in the car and head into the hills for a well-earned plate of pork. 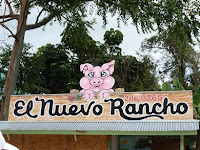 Guavate is the town where you will find a number of roadside restaurants selling roasted pig 7 days a week, all day long. 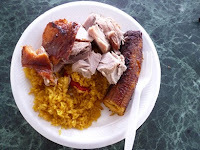 Succulent, tender, juicy pieces of pork and crackling served with the Caribbean stable of rice and beans and plantain. Nothing fancy, served with plastic forks but simply delicious! It was the gastronomic highlight of the day. 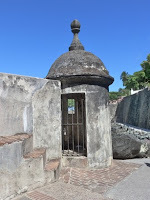 We spent a couple of days exploring Culebra; one of the Spanish Virgin Island; walking around the tidy waterfront of Dewy, the tiny main town. We walked up and over the hill from the south side of the island to the north, on a 3 mile hike in the blazing sun to the beautiful beach at Flamingo Bay. 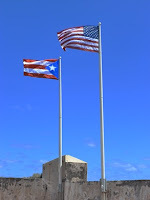 It is a popular spot with locals and tourists from mainland Puerto Rico with showers, snack bars and picnic tables. The Puerto Ricans arrive in big groups carrying big containers full of food and drink and loud music resonates across the bay. The beach itself is lovely with crystal clear pools getting deeper where rolling waves break as the water shallows. After relaxing under a small palm tree, resting after the hot walk we dove into the sea jumping or ducking the rollers as they came in. Later when we were hungry we got a bit to eat at the cantinas. The Latin Americans sure know how to snack, the colourful bars and snack huts were offering an array of deliciously, bad fried foods from the meat filled pastries called Empanadillas, to Monfongo, a smashed plaintain or yucca, Surullitos, bacalaitos or alacapurrias, meat or fish in a deep fried casing of plantains to name a few. I don’t know how all the gorgeous Latina women stay so trim with all this fried food. We sailed the next day to Vieques, an island that has not been subjected to development over the years due to the US Navy owning 2/3rds of it, they use it for bombing practice. After resistance from those that oppose the bombing, the military finally announced that in 2003 bombing will cease. 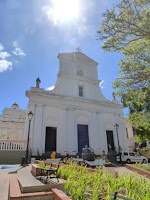 Since then the island has become the largest national fish and wildlife refuge in the Caribbean. Because of the underdevelopment, most of the beaches are unspoiled (perhaps except by bombs!) and have been left as nature intended them. 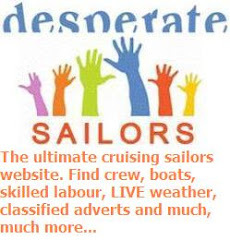 We anchored at the west end of the island at a place called Green beach. And you can understand why; palm trees and thick verdant foliage come right down to the waters edge. The dark golden beach looks like an untouched tropical paradise. As we arrived fairly late in the day we only swam from the boat to check the anchor was dug in. Under the boat a very large ray eyes us cautiously but doesn’t move from his snug spot nestled in the sand. The rocky ledges were swarming with sea life; fish rush about while fan corals gently swayed in the current. We snorkeled for a while and cleaned a few more barnacles off the hull. The following day we got up early as we were keen to keep on the move. But first we had to go and walk on this stunning beach, so very different from the one we were on the day before. Despite the ‘no see ums’ and small biting flies that were out in their masses (every paradise comes at a cost) We walked along the beach, collecting shells, watching spotted eagle rays and star fish in the shallow water. A lone egret quietly hunted for small fish and crustaceans as the sun rose over the palm trees to still and hazy day. Days like this are just priceless and I remember how privileged I am. 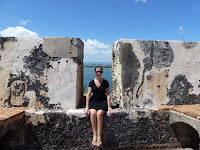 I hope we will get to visit Vieques again to further explore such a beautiful and unspoiled island. 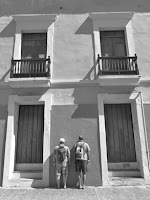 For now we are in Salinas in the middle of Puerto Ricos’ south coast. It’s a good safe place to leave me and the boat while Sim makes a visit back to the UK. Its a bank holiday (Easter!) and all the local sport fishing boats are in and out of the bay with tinny Latino music blasting from speakers. In the mean time I am trying to spot manatees (seacows) that are supposed to inhabit these waters.